Lesbian and bisexual women held instrumental and important roles in the fight for justice and equality that started over 100 years ago. News 6 February, 2018 . Written by Katie Donohoe. Today we celebrate 100 years of women’s vote in the UK and Ireland. When picturing the women who fought for their rights in 1918, most will think of the archetypal suffragette: straight, white and able-bodied. This stereotypical persona was depicted in the 2015 film Suffragette. Many accused the film’s creators of “whitewashing” the feminist movement that got women the right to vote. The typical understanding of who the suffragettes were fails to include many key figures of the political revolution, for example, the true prominence of queer women in the movement. Historian Diane Atkinson, author of Rise Up Women! The Remarkable Lives of the Suffragettes told Broadly about the “long and enduring romantic relationship” between suffragettes Evelina Haverfield and the Pankhursts’ chauffeur, Vera ‘Jack’ Holme. “These two were quite openly a couple and, in fact, they had each other’s initials carved on their bed,” she says. 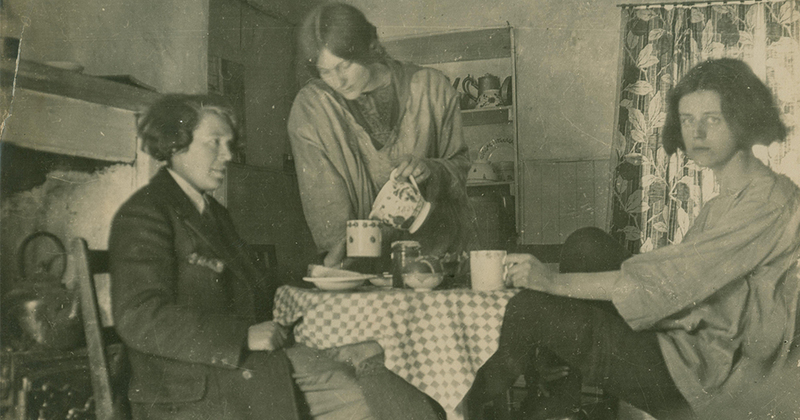 Vera Holme (left) with Evelina Haverfield who were prominent in the Women’s Suffrage Movement. Image: Spartacus Educational Publishers Ltd. In Ireland, Kathleen Lynn was a prominent figure in the Suffragette movement. The relationship between Lynn and her life partner Madeleine ffrench-Mullen was described as “having all the markings of a marriage”. Kathleen was a member of the executive committee of the Irish Women’s Suffragette and Local Government Association from 1903 until 1916. She joined the Irish Citizen Army and was chief medical officer during the 1916 Easter Rising. She described herself as “a Red Cross doctor and a belligerent” when she was arrested. She was imprisoned in Kilmainham Gaol with her comrades Countess Markievicz, Molony and Madeleine ffrench-Mullen. You can watch the documentary Kathleen Lynn – The Rebel Doctor, on the IFI Player here. McCollum also remarked that queer women played an absolutely critical role and held some of the most prominent leadership figure, such as Ethel Smyth, the composer of suffragette anthem The March of the Women. Women in Ireland are still fighting for equality, autonomy and freedom in 2018. Later this year, Ireland will vote on the referendum to ‘repeal and replace’ the Eighth Amendment. In honour of the countless suffragettes who fought for women’s right to vote, you should check that you’re registered to vote here. 6 February, 2018 . Written by Katie Donohoe.